As it was a Sunday, there was some more work. It has not been raining but for a 'spray-bottle drizzle' for a minute that does not even wet the ground. It may not rain for a few more days. The Yarden is presently weed-free. I dare not say that! At least for a few days. This week I discovered another new word - "Weedling". I was removing hundreds of tiny weeds from pathways and beds when it just flashed "why not I call them weedlings?". With all the beds full, I now begin to wonder where I should plant these seedlings when they are big enough? Except a few, most of the seeds sent by Dee from Arrayo Grande, California, USA. She is in Zone 9a and I'm in 10a. So the seeds and plants are expected to do well as there is not much difference in the growing zones. Cooler areas are having less number and warmer areas higher, classified esp. according to temperature variation. All the seeds growing here are new to me. I have the Gladiolus but had not grown from seed. They were ready corms. It is only hoped they grow and bloom and demands plenty of patience. The fortnight lily in the left bottom picture took 5 weeks to show up! Cosmos picotee opened yesterday and what a shade it is! I see ants on this plant - have to check and observe why they loiter on this. Pictured left is the first flower, first day. Bed with Primrose seedlings and broken pots used for seed germination - I have Tithonia in them. Next to cosmos I have planted the Zinnia seeds directly. I also repotted the Viola odorata seen with the shallow pot. I added compost to see the result. I exchanged places of the tyre planters on the edge of the pond. The other planter with Aechmea gamosepala near the football lily leaves was dragged from another spot near the shed where I planted Podranea. The Aechmea plants were re-planted, after removing some weeds. Observe the cement bag on the bottom. Tabernaemontana plant has been put there from a small cover. I had to paint guidelines for the car park position as there is a slight angle from the gate. The skew in the plot creates a strange illusion. The plants seen on the left are hibiscus, under which grows one Marigold plant and two Balsam plants at their feet. Betel leaves and Basil also grow there, but just out of frame. From the shed roof, rain water is diverted into the small barrels you see there. Also visible is our main rain water filter system near the window. I deliberately leave a puddle in the driveway. The dent in the stone slab makes water stagnate and the Mynas and Spotted dove like to drink from there! Even in dry weather, I add some water at that place. Sometimes these birds also use the birdbath. Picture of the Myna taken yesterday when there was a slight drizzle and some rain water had stayed on. I have found some more space for the Jaquemontia vine, by moving some rocks to another place. That will be in the next post. Love this post, Dinu. My favorite? 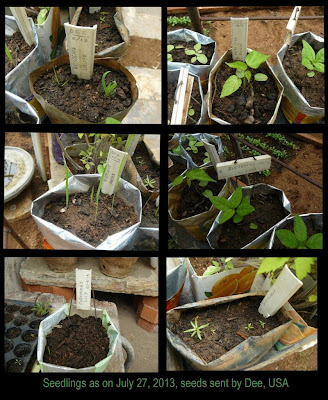 The creative use of a cement bag! Oh, and the fact that you leave water in the depressions in the driveway!